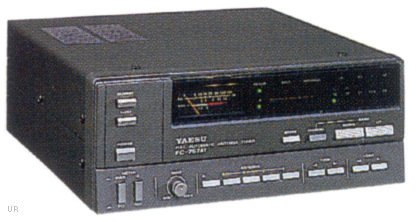 The Yaesu FC-757AT automatic antenna tuner is designed to work with the FT-757GX, FT-757GXII and FT-747GX transceivers. (It can also work the FT-980 with an additional optional cable). The frequency range of this tuner is: 1.8-2, 3.5-4, 7-7.5, 10-10.5, 14-14.5, 18-18.5, 21-21.5, 24.5-25 and 28-29.9 MHz. The maximum RF power is 150 watts. The meter power ranges are 15 and 150 watts. The built-in 4-bit microprocessor allows for fast, accurate automatic tuning. Two antenna jacks are provided. Includes a built-in dummy load. Requires 13.5 VDC at 300 mA.